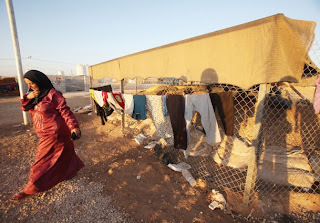 UNHCR wanted Turkey to manufacture 18,500 tents which would be used by Syrian shelter seekers. Turkish Red Crescent and the Office of the United Nations High Commissioner for Refugees (UNHCR) signed a cooperation protocol on Wednesday within the framework of providing accommodation for more than 90,000 Syrians in Turkey. Ahmet Lutfi Akar, the President of the Turkish Red Crescent, and UNHCR representative to Turkey Carol Batchelor attended the signing ceremony. Akar said that UNHCR wanted Turkey to manufacture 18,500 tents which would be used by Syrian shelter seekers. He added that UNHCR ordered 18,500 tents which worth 15.4 million USD. Furthermore, Batchelor drew attentions to the developing and increasing cooperation between UNHCR and Turkish Red Crescent. She referred to the tents and said that the cooperation was a big step to take. Batchelor added that the hospitality and generous relief aids of Turkish people for Syrian shelter seekers was impressive and made them happy. She said, "Turkish Red Crescent is known with its successful operations around the world. There is a professional team. Turkish government, Turkish Prime Ministry Disaster and Emergency Management Directorate (AFAD) and Turkish Red Crescent work hard for Syrians. With new tents, Turkish Red Crescent took a step further which will ease the lives of people in Syria."